Ubisoft officially announce Red Steel, a first person shooter launch title for Nintendo Revolution. Ubisoft have announced their offering for the Revolution launch with "Red Steel", a first person shooter than it set to show off the unique freestyle controller only available on Revolution. Red Steel is set in modern-day Japan. Players will master both the ancient art of the katana and the sophisticated technology of modern firearms taking advantage of the emotion and immersive gameplay possible only with the Revolution's remarkable controller. Serge Hascoet, chief creative officer at Ubisoft had this to say about the partnership with Nintendo. "We're honored to announce this exciting new franchise and we're confident that Red Steel will be the must-have title for Revolution when it launches. We have been working closely with Nintendo to take full advantage of the innovate controller to create a thrilling experience that can only exist on Revolution." "Nintendo is excited to have Ubisoft bring Red Steel to the Revolution launch lineup. Ubisoft makes some of the most innovative and critically acclaimed games in the industry and from what we have seen from Red Steel it is going to be a standout exclusive title on Revolution." 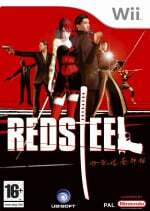 Red Steel has received alot of web attention over the past week, only a few days ago, Joystiq reported magazine scans of an article containing screenshots of Red Steel, but have since been removed by request of the magazine. The magazine in question is GameInformer whom have an exclusive hands on with Red Steel in their latest issue. We're expecting to get our hands on some official screenshots very soon, so keep your eyes on that RSS feed.